Linawaty Ko follows a joyous Balinese royal funeral procession. For a very long time I had been hoping to see the Ngaben cremation procession in Bali. Finally, and by pure coincidence, I witnessed this amazing event last month when the funeral of the late Tjokorda Putra Dharma Yudha, one of the family members of the Ubud Kingdom, was carried out in the centre of Ubud town. Thousands of people, including tourists, crammed into the area to witness this event. 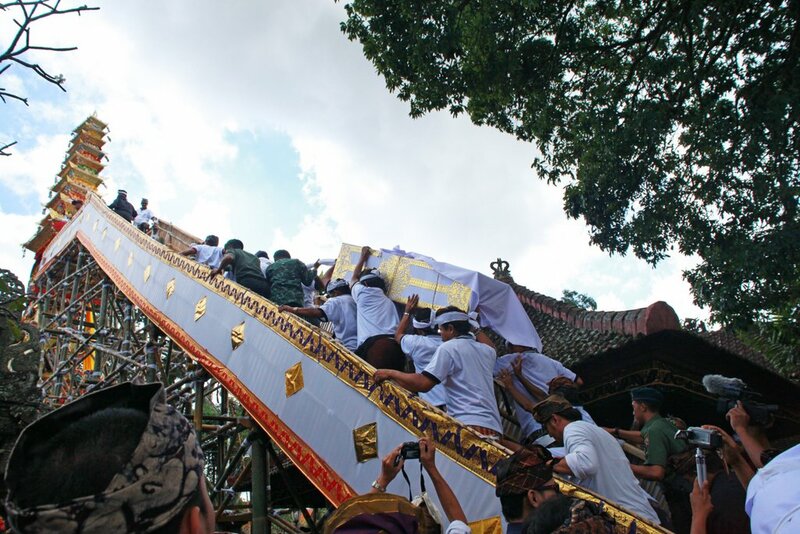 At exactly 1pm, after an hour of continuous prayer, the coffin was carried up and laid on the top of a 21-metre-high bade. The pagoda-like structure was made from bamboo, paper, and wood, and was visually impressive and grand with elaborate decoration. In August the weather is extremely pleasant in Bali, with the temperature generally hovering between 25 and 28 degrees Celsius during the day. Under a beautiful blue sky and cooling air, the procession begun. 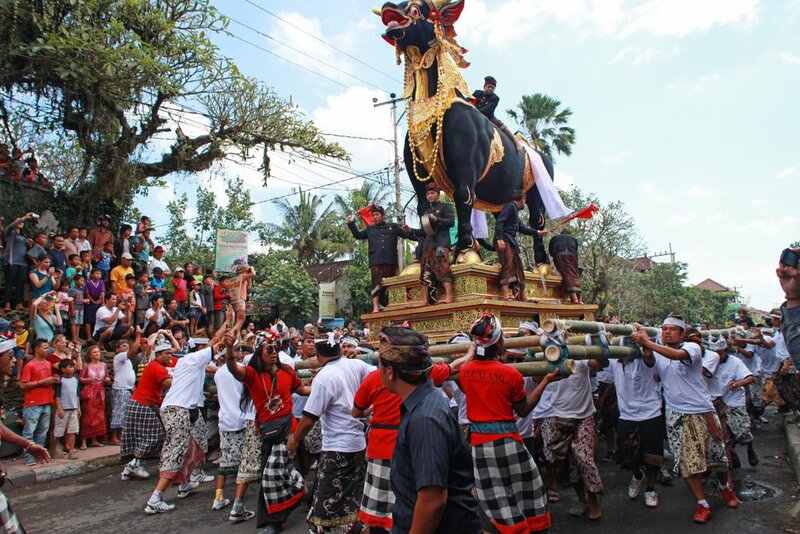 Ninety or so young Balinese men lifted the four tonne bade and moved toward the cremation site located roughly two kilometres away. 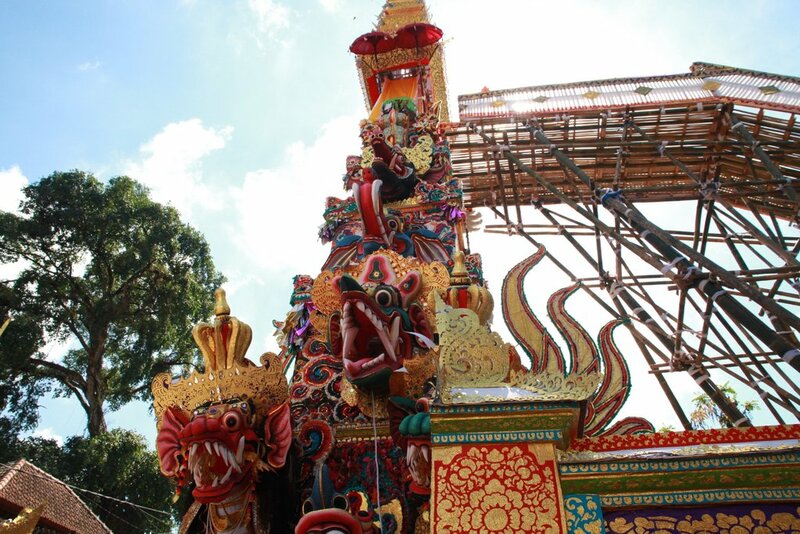 Lined before the bade was an eight-metre-high nagabanda (dragon effigy) and a huge sarcophagus resembling a bull, made from a bamboo structure covered in paper. All were carried by the young men, with the slow procession accompanied by a troop of Balinese musicians. At every corner of the street the bade was spun in circles, as Balinese believe this helps to confuse the evil spirits and keep them away from the deceased. Two hours after the procession began, the black bull finally reached the cremation site, followed shortly by the dragon and finally the bade. Placed on a concrete stage, the black bull sarchophagus was sliced open on the back, and the deceased’s body was moved from the bade into the body of the bull. The final ritual was then carried out by a Hindu priest, who sprinkled holy water on the bull, while the deceased’s family members placed offerings around the body. Finally the climax of Ngaben arrived, when a fire was lit under the sarcophagus with the body inside. The fire is used to free the spirit from the body and enable reincarnation. 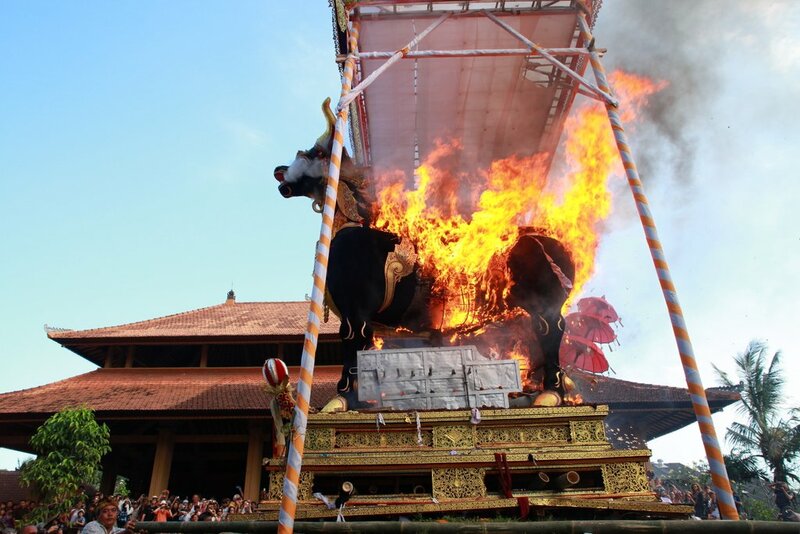 No tears were shed by anyone, because the Balinese believe that the deceased is only temporarily not present, and will reincarnate or find his final rest in moksha (heaven). The final ceremony was held 12 days after the Ngaben, when the ashes were wrapped in a white and yellow cloth and were sunk into the sea. 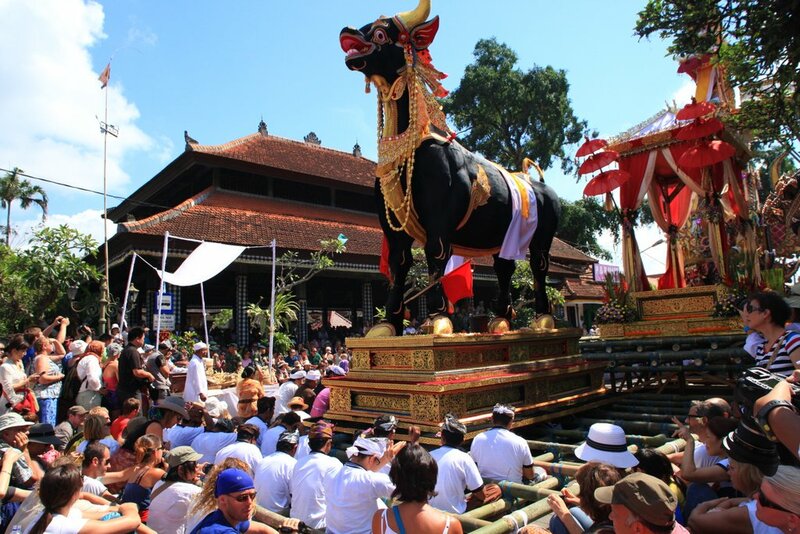 Ngaben is a traditional Balinese funeral ceremony that has been carried out since ancient times. The locals believe that this ceremony purifies the souls of the deceased. 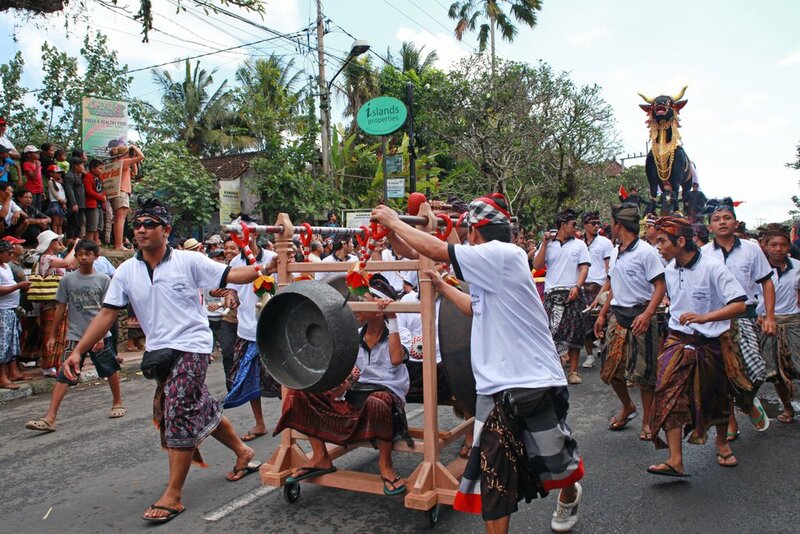 Unlike many western funerals, Ngaben is a joyful occasion for Balinese as it represents the release of their ancestor’s spirit, and the accomplishment of their family duty.